I love receiving tweets like this!! One of the big question marks surrounding BlackBerry 10 has been carrier support. It doesn't matter how good a mobile operating system is - if carriers don't want to sell it, you don't have much hope. On my recent trip to BlackBerry HQ I questioned the company's new CMO Frank Boulben on this issue, who made it clear that support from carriers around the world, including the USA, is there. Frank noted Verizon's launch of the BlackBerry Curve 9310 as a sign of ongoing support. Looking ahead to BlackBerry 10, Frank couldn't get into the specifics, but did say they are very engaged with US carriers around the launch of BlackBerry 10. 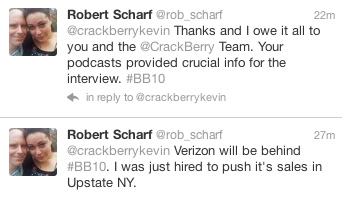 A tweet like this from @rob_scharf is further evidence that the Verizon BB10 launch wheels are in motion. For a while there I think many of us -- myself included -- we're starting to wonder if BlackBerry 10 would ever come to market. Sure, Q1 2013 is still months away, but activities like Verizon hiring people now to sell BlackBerry 10 is a positive sign that it absolutely is going to happen. It's also good to see that Verizon is hiring passionate people! Robert starts his new role on Monday and we wish him all the best! !